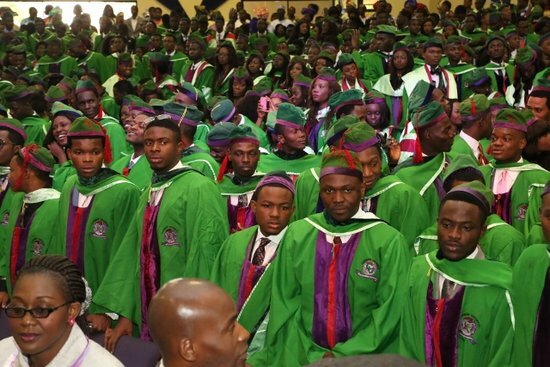 A total of 188 students of Covenant University in Ota, Ogun, on Friday graduated with the first class degree at the 2016/2017 convocation ceremony of the institution. Aaron Atayero, the vice-chancellor (VC), disclosed this during the 12th convocation ceremony and conferment of honorary doctorate degrees and presentation of prizes. NAN reports that 1,426 students graduated this academic session. They comprised 188 with first class honours degree, 568 with second class upper honours, 322 with second class lower, 47 with third class and 301 post graduate students. Atayero said the university had trained a set of “expert thinkers and world changers” that had the ability to thrive in adversity and contribute their quotas to national development. The VC said that the institution was a foremost private university in Nigeria, setting the pace for other public and private institutions. “Covenant University has continued to be at the cutting edge of innovation and research in proffering solutions to the nation’s challenges,” he said. David Oyedepo, the university chancellor, said that the 2016 edition of the Nigerian graduate report ranked the products of the institution as the most employable graduates among all Nigerian universities. Oyedepo said that most of the nation’s challenges needed indigenous solutions rather than foreign ones. He said that the nation found itself where it was by choice, adding that it was time individual and leaders took the responsibility of solving the nation’s problems. “Education would enhance such initiative in solving the nation’s challenges because it cannot give what we do not have in solving our problems,” he said. Oyedepo urged the graduands to go forth well prepared to take responsibilities as they were going into a world of endless opportunities. He also advised them to be purposeful contributors to the development of the nation. Cecilia Akintomide, a former vice-president and secretary general in African Development Bank, in a keynote address, said that Nigeria could not continue to maintain the status quo in the education sector. “The continued creation of private universities with inadequate funding for public universities will generate inequities that will haunt our future,” she said. Akintomide said that resources available for public universities were limited in providing employable graduates. She stressed the need for the federal government to grant scholarship to less privileged people so that they could achieve their dreams and contribute to the nation’s development.